Poetry absorbs and reflects so much of the human experience—so much about culture, history, memory, love, the body, art, and God, says Peter Balakian, a Pulitzer Prize winning poet. Then why is it so often regarded as a pleasant but superfluous literary exercise? 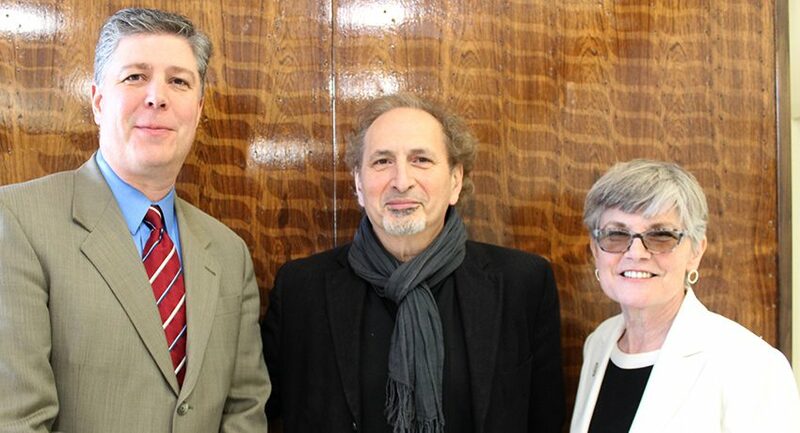 Balakian, who won the 2016 Pulitzer Prize in poetry for his book, “Ozone Journal,” gave a talk titled “Writing for Human Rights: The Crucial Role of Literature in Social Change.” He was the spring keynote speaker and the final lecturer of the 2017-18 Provost’s Series on Democracy and Diplomacy. The event was presented in connection with the Honors Program Author Series and was open to faculty, students, and staff members as well as WSU classes. In addition to the Pulitzer Prize, Balakian has had two New York Times bestseller list non-fiction books. He is the Donald M. and Constance H. Rebar Professor in Humanities and professor of English at Colgate University, and is one of the foremost experts in the world on the Armenian Genocide of 1915 to 1918. In his opening remarks, President Barry M. Maloney said Balakian’s literary focus and social activism speak to the continuing importance of a liberal arts education. Among topics Balakian discussed was poetry’s unique ability to convey societal violence, such as the trauma of the Armenian Genocide, which claimed the lives of at least one million people at the hands of the Ottoman Turks. In addition to excerpts from a couple of his poems, he read a selection from his 1997 book, “Black Dog of Fate,” a memoir of his coming of age as an Armenian American in suburban Teaneck and Tenafly, N.J., in the late 1950s into the 1960s. “But trauma is hard to fully repress so the traumatic past would leak through the sunlight of sunny suburbia during various and strange moments that I explore in my memoir,” he said. Balakian’s maternal grandmother was the only adult survivor in her family in 1915. They had been prosperous silk merchants living in Diyarbakir, an historic Armenian and Kurdish city in the southeast part of Turkey. The Armenians of Diyarbakir were almost entirely annihilated, but she survived with her two infant daughters. Balakian said the memoir is, in many ways, more his grandmother’s story than his own. Balakian’s focus isn’t solely on the past, however. He readily takes on the challenging social issues of today, such as race and inequality, and had an opportunity to discuss them with students after the talk. 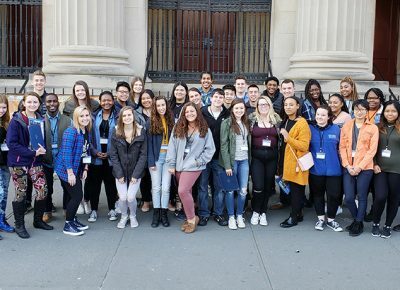 Thirty-four students from the Community Leadership Experience at Worcester State (CLEWS) travelled to New York City, and took part in a community-learning experience at the Mount Olive Baptist Church, led by Michael Eatman and his father, Pastor Charles Eatman, on April 21-22. The CLEWS team worked with children on Saturday, and on Sunday visited the Museum of the City of New York, for a show . . .